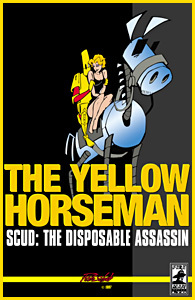 Scud The Disposable Assassin, the name, title, character and practically everything and anything in this site is copyrighted 1996 by Rob Schrab. Any similarity between the fictional characters in Scud : The Disposable Assassin and persons alive or dead is purely coincidental. Unless it's funnier on purpose. This page designed by Steven Schrab.